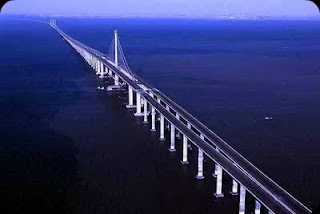 The 26.4 mile-long Qingdao Haiwan Bridge - the world's longest bridge over sea water - opens to traffic in China. 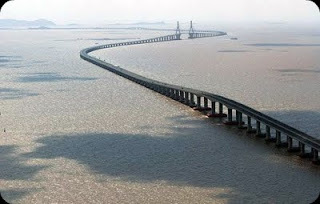 The marathon-length Qingdao Haiwan Bridge would easily span the English Channel and is almost three miles longer than the previous record-holder, the Lake Pontchartrain Causeway in the American state of Louisiana. The vast structure links the centre of the booming port city of Qingdao in eastern China's Shandong Province with the suburb of Huangdao, spanning the wide blue waters of Jiaozhou Bay. 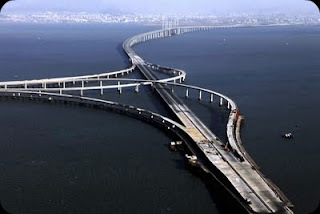 The bridge is expected to carry over 30,000 cars a day and will cut the commute between the city of Qingdao and the sprawling suburb of Huangdao by between 20 and 30 minutes. 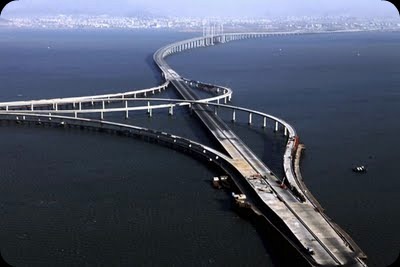 The sheer scale of the bridge reveals further recent advances made by Chinese engineering. 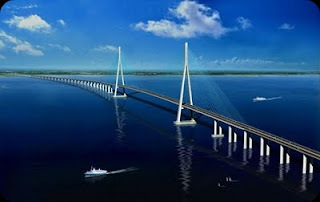 China is already home to seven of the world's 10 lengthiest bridges, including the world's longest, the 102-mile Danyang-Kunshan rail bridge, which runs over land and water near Shanghai.